A vow by state Sen. Dan Patrick, the GOP candidate for lieutenant governor, to repeal the Texas DREAM Act could face criticism from Republicans trying to reach out to Hispanic voters. 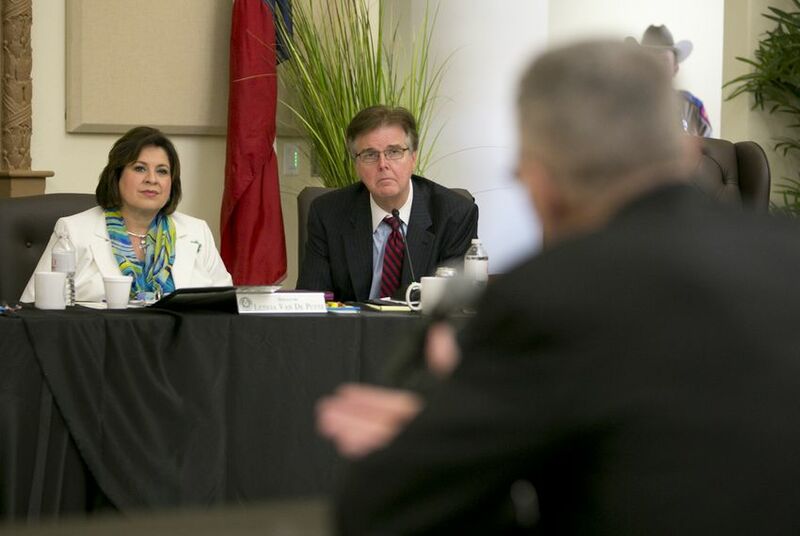 If elected lieutenant governor in November, state Sen. Dan Patrick, R-Houston, has vowed to repeal the law that allows undocumented students to pay in-state tuition at Texas community colleges and universities. His stance on the issue puts the front-runner squarely at odds with his Democratic opponent, state Sen. Leticia Van de Putte, who sponsored the measure, known as the Texas DREAM Act, in 2001, when it passed with overwhelming Republican support. While his call for a repeal could gain traction among some conservative lawmakers, Patrick could face criticism from business groups that support the law and could hurt efforts of Republicans trying to reach out Hispanic voters. “It unfortunately can serve as a detriment to our outreach efforts,” said George Antuna, a founder of Hispanic Republicans of Texas, adding that most Hispanic Republicans consider the law good policy. His organization recruits and supports Hispanic Republicans running for public office. Hector de Leon, co-chairman of the Associated Republicans of Texas, said pushing for a repeal of the law was "unnecessary" and would alienate the Hispanic voters Republicans will need in future elections as Texas' Hispanic population continues to grow. The Texas DREAM Act allows undocumented immigrants who graduate from Texas high schools and have lived in the state for at least three years to pay in-state tuition at public community colleges and universities. Polling shows that approval for the Texas DREAM Act is high among Hispanic voters while a majority of Texas Republicans who identify with the Tea Party disapprove of the law. Patrick is also likely to face opposition from the Texas Association of Business, which recently endorsed him instead of Van de Putte. There have been several failed attempts by state lawmakers, including Patrick, to repeal the DREAM Act. Such efforts have not gained traction. But the Senate’s 31-member body will be more conservative in the coming legislative session, and only one of the Republican senators who voted to pass the law will return in January. Van de Putte described Patrick’s opposition to the tuition law as “anti-education” for the state’s immigrants because repealing the act could keep Texas residents who “are here by no fault of their own” from attending college. “His first order of business is to repeal something that has been working in our state for 13 years,” Van de Putte said. Further efforts to repeal the law will come after Gov. Rick Perry, who signed it into law and has adamantly defended it, leaves in January. Without the threat of a veto, Republicans who oppose the bill but were apprehensive about the ramifications of a repeal would be left with no “cover” to oppose a repeal, according to Mark P. Jones, a political scientist at Rice University. Jones said it was likely that there could be a close and controversial Senate vote to repeal the law, although it could run into “insurmountable” obstacles in the House and among Republicans looking to connect with Hispanics. Disclosure: The Texas Association of Business and Rice University are corporate sponsors of The Texas Tribune. A complete list of Texas Tribune donors and sponsors can be viewed here.